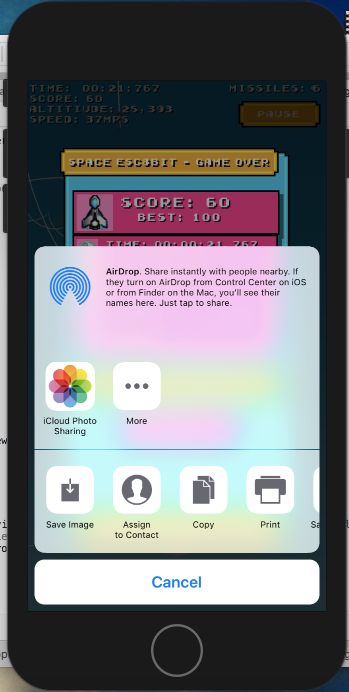 [Code Sample] - Sharing screenshots in game to Social Media (iOS and Android). I've got another code sample/tutorial here for you all. This one is for sharing a screenshot from in game to social media. Its implemented in our latest game Space Esc8bit to share scores to twitter or facebook. It works on both iOS and Android and can share it to whatever sharing apps you have on your mobile (iMessage, Twitter, SnapChat, Facebook etc...). It's pretty small bit of code, but I hope this helps! I'm going to continue sharing bits of code like this, so if you like it give Virtex Edges blog a follow or follow us on twitter and I'll try to post more things like this!